Her office was forced to take down a summary of the bill because it contained a series of gaffes. Those included anti-nuclear power language, a reference to “farting cows” and welfare for “unwilling” workers. The Green New Deal resolution, which has more than sixty cosponsors in the House, does not have language ruling out nuclear or banning fossil fuels, but its accompanying FAQ actually did. A Green New Deal is a massive investment in renewable energy production and would not include creating new nuclear plants. It’s unclear if we will be able to decommission every nuclear plant within 10 years, but the plan is to transition off of nuclear and all fossil fuels as soon as possible. U.S. Representative Alexandria Ocasio-Cortez (D-NY) moves through a group of reporters after a news conference for the proposed “Green New Deal” to achieve net-zero greenhouse gas emissions in 10 years, at the U.S. Capitol in Washington, U.S. February 7, 2019. REUTERS/Jonathan Ernst. “Realistically, you can’t decommission a nuclear plant in ten years,” Harrell told TheDCNF. Harrell wasn’t the only one to notice the discrepancy. Mike Shellenberger, founder of the pro-nuclear group Environmental Progress, called for Ocasio-Cortez do clear up the confusion. 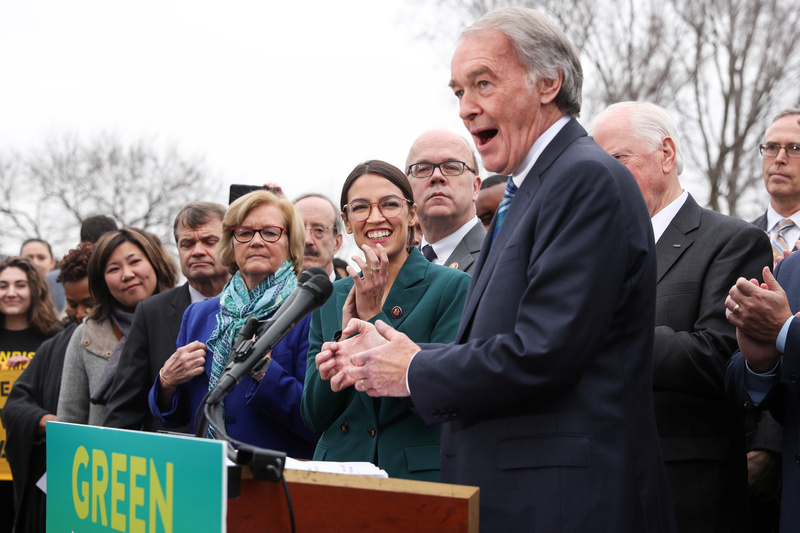 Shellenberger pointed to the fact Ocasio-Cortez herself said at a Capitol Hill rally for the Green New Deal was about “transitioning to 100% renewable energy,” despite the legislative text. Energy expert Christopher Clack, who co-authored a comprehensive study on the feasibility of a 100 percent renewable grid, told TheDCNF that while he thought the legislative text was “ambitious and far-reaching,” the FAQ complicated things. Clack’s study estimated that completely decarbonizing the grid, including the use of nuclear power and carbon capture, would cost somewhere between $20 trillion and $40 trillion by 2050. Ocasio-Cortez’s staff took out the anti-nuclear language from the FAQ posted on her congressional website. However, that FAQ page was taken down Thursday afternoon. But those weren’t the only changes made to the FAQ before it was taken down. The FAQ also called for a “[b]uild out highspeed rail at a scale where air travel stops becoming necessary.” Ocasio-Cortez’s staff eventually deleted “farting” from the FAQ, but not before reporters found it. Democrats were also hard-pressed to explain how Americans would phase out the internal combustion engine and what a world without air travel would look like. Also included in Ocasio-Cortez’s FAQ was the promise of “[e]conomic security to all who are unable or unwilling to work,” which was also missing from the legislation. House Speaker Nancy Pelosi dismissed the Green New Deal as a “suggestion,” and named more members to the House climate change committee. Ocasio-Cortez was not named to the committee. Democratic Massachusetts Senator Ed Markey introduced a companion bill in the Senate Thursday that was cosponsored by several Democratic 2020 hopefuls. The Green New Deal’s FAQ at least twice mentioned planting trees as a way to sequester carbon dioxide emissions and fight global warming. In fact, the FAQ says a Green New Deal would mean we “plant lots of trees” to reduce emissions. “We believe the right way to capture carbon is to plant trees and restore our natural ecosystems. CCUS technology to date has not proven effective,” reads the FAQ, referring to carbon capture technology. “Planting trees is not going to eliminate or reduce emissions from a variety of point sources. In the end, you need carbon capture and nuclear to meet emissions goals,” Harrell said.